5 Reasons Why Students Should Focus on Fulfillment and Not Achievement The College Acceptance Chronicles: How Does One Get Into Emory? One of the most exciting parts of the college admissions season is exploring the options of where to apply. This, in turn, can also be the most terrifying part. When feeling overwhelmed by the thousands of options for college, students often retreat to their comfort zones and shy away from opportunities that will enable them to grow by venturing into the unknown. Moving away from home can certainly be scary, and it is a natural reaction to try to minimize risk in any stressful circumstance; however, there is no better place to stretch personal limits than at college — a place that is literally built to support and guide individuals through exploration and development. There are so many benefits to applying to schools that are outside of our comfort zone. Here are a few of my favorites. We cannot expect to excel academically or in our careers without stepping out of our habits and routines. If we continue to do what we’ve done in the past, we will garner the same results. Not only does trying something new give us an opportunity to succeed at something we’ve never succeeded at before, but it also helps us do better at everything. Studies have shown that the anxiety we feel when presented with a risk actually improves focus and performance. Going to a school that is academically or socially challenging will force us to rise to the occasion, not only helping us to garner new skills and coping mechanisms, but also helping us to gain a newfound sense of confidence that we can overcome anything. Every time we choose to play it safe, we’re robbing ourselves of a powerful opportunity to learn and keep our brains active and healthy. And, unfortunately it doesn’t get easier as we get older. In fact, we become more risk averse as we age, which can be detrimental to our mental acuity and overall well-being. Additionally, regret is a powerful depressant. It can be hard to look back on our lives and feel a barrage of what if’s. What if I had applied to that killer program across the country or tried my chances at that dream school despite its low admit rate? What if the question changed to WHY NOT? You may be surprised to learn that your favorite singer or heart throb actor has failed more than the average person. In fact, creative people fail very often, and successful people are only successful because they’ve become really good at failing. Opening yourself to criticism is innately risky, but it also helps you strengthen your creative muscles. The more you do it, the less likely you will be afraid to do it again, increasing your chances for achievement. A recent study even showed that students who took the leap to study abroad scored higher on tests for creativity than students who stayed at home. Becoming comfortable in taking calculated risks cultivates “openness to experience,” one of the Big Five personality traits characterized by intellectual curiosity, self-exploration, and imagination. This trait has been shown to be one of the best predictors of creative achievement; for it is creativity that enables individuals to harness innovative ideas that are not only impactful to their own lives, but also to those around them and the world at large. 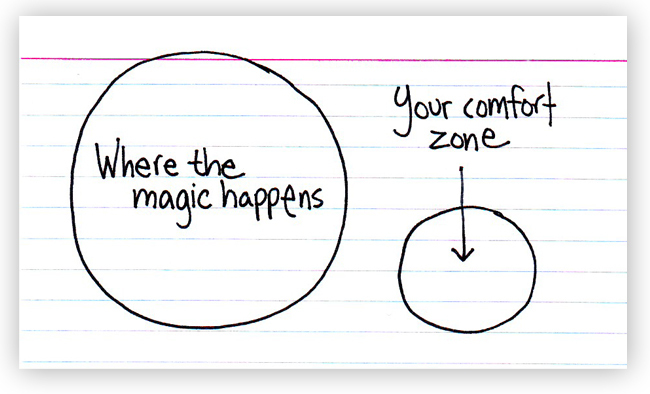 At Rainbow Tutoring we love to help students understand the inherent benefits of stepping out of their comfort zones. It’s one of several central themes in our Paving The Way… workshop series. If you are ready to take the plunge and try something guaranteed to transform you into a fearless, empowered student with a greater sense of purpose we invite you to get a taste of Paving during our one day teaser on October 18th! For more information about this and future teasers and what they entail, email our office or call us at 310-902-7912. So now, ask yourself, are you willing and ready to step outside your comfort zone? When was the last time you did so? Leave some inspiration in the comments below or on our Facebook Page for students struggling through their decision of whether or not to apply to that “risky” school.